■ The creation of a preperitoneal space is standardized and represents a minimally invasive approach to prostate. 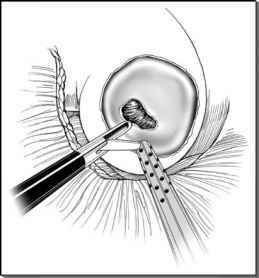 ■ Prostate dissection is performed in a traditional anterograde fashion and allows preservation of the neurovascular bundles. ■ The extraperitoneal approach reduces risk of intraperitoneal injuries during laparoscopic access. It may also decrease incidence of postoperative ileus and pain. ■ Previous inguinal herniorraphy with mesh increases the complexity of prevesical space development. Pelvic lymphadenectomy is often impossible in these cases. ■ Attempts to decrease operative time and perioperative morbidity should not outrival the oncologic principles. ■ Further evaluation of long-term results of this technique is necessary.